1. Easy to grow, hard to grow. For some people, Christmas cactus ( Schlumbergera) grows like a backyard weed. For others, it's a disappointing, frustrating challenge. It seems that the biggest issue is watering - too much or too little will send the leaves into a wilting faint, cause buds to drop or leaf segments to break off. Christmas cactus likes humidity (it comes from Brazil, remember?) but it abhors wet roots, which can cause root rot and fungal diseases to set in. •	Likes evenly moist soil, but allow top one inch to dry out between watering. •	Likes humidity, so set on a tray of moist pebbles. Mist occasionally. •	Water as often as every two or three days when it is warm and sunny, but only once a week or less when it is cool and humid. •	Stop watering in October. Resume light watering in mid-November. •	Water normally till blooms are finished, then reduce water to give it a rest for about six weeks. •	Add fertilizer (20-20-20) two to four times a year but stop in September a month before bud set and resume in February when days get longer. 3. Oooh. The light hurts my eyes. Schlumbergera are photosensitive, meaning their blossoms are triggered by the shortening of the days and by a drop in temperature (50 F to 60 F or 10 C to 12 C). Start withdrawing light for 12 hours (usually in September and October), about six to eight weeks before you want bloom. Bring into a brighter area when buds start to form. If buds drop, move to an even brighter location (not direct sunlight) and add a little fertilizer. Although a member of the cactus family, Schlumbergera is closer in relationship to orchids than to the dessert plants its common name suggests. In the wild, it anchors itself to a tree (epiphytic) with its roots exposed to the elements and lives off what it can collect from air and water, or a rock (epilithic), where it collects what it can from rock debris and rainwater. It is a succulent though, storing water in its leaves. 5. Friend to hummingbirds and other stuff. Schlumbergera comes from Brazil and is specifically adapted to releasing its nectar to hummingbirds. By the way, in Brazil it blooms in May and is known as flor de Maio. It is NOT poisonous. 6. Flat stems, round stems. The two common types of the six species are the Truncata group (flat stems and yellow pollen) and the Russelliana group (rounded, less toothy leaves). A cross between the two results in a variety named Buckleyi (rounded stems, and flowers hang down) which produces pink pollen. Schlumbergera likes to be pot bound so don't be too generous with the pot size, but rather repot every other year or so, preferably between February and April. Add fresh medium when you do - a mix of three parts peat or potting mix to one part sharp sand or perlite; Schlumbergera likes things a little on the acid side. A light orchid mix works well, too. The easiest way to increase Schlumbergera is to take leaf cuttings - two to three segments - and stick them halfway down into a mix the same as that of the parent. You should have roots in two to three weeks. Fertilize when one new segment appears. 9. The aging Christmas cactus. This is a long-lived plant whose lifespan in measured in decades. As the cactus gets old, the branches near the roots will appear to become woody and tough. 10. It's dying. What can I do? 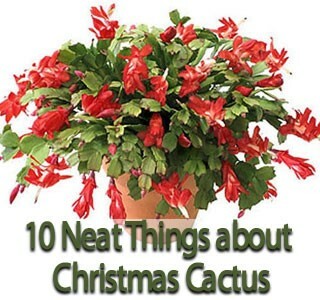 If your Christmas cactus is ill, first take stem cuttings to salvage an offspring in case the remedies don't work. If the leaves are limp and the soil dry, soak in water for a few hours. If the soil is wet and the leaves are limp, wash off the soil and repot in an evenly moist medium. If there are white spots on the leaves, use a fungicide. If the roots are rotted, start over.